One day, when I have unlimited funds (and unlimited holiday time), I'll hop on a plane to Brrrraaaaaaazil. I'll spend the first few days in Sao Paulo, exploring Liberdade (or "Japantown", their version of Chinatown), digging into the popular mortadela sandwiches in the Mercado Municipal and catching one of the free Sunday concerts at Ibirapuera. I might also be tempted to shrink myself down to kid proportions so I can join in the fun at Parque da Monica. After that I'll head on over to Argentina where I'll most certainly be doing a tango in the streets of Buenos Aires. Yes sir, I can boogie and all that. The Recoleta cemetery is next on my to-do list featuring, amongst other famous personalities, Evita's grave. Can you say star-struck? And of course no visit to Argentina would be complete without doing the full-blown carnivore thing and sinking my teeth into a big juicy piece of bife de chorizo. From there I'll head to the majestic Incan ruins in Macchu Picchu, Peru, before travelling north to the bohemian district of Miraflores in Lima. Of course I'll pay a visit to Pachacamac on the outskirts of the city. Because who can pass up an opportunity to see some more Inca ruins? And, seeing as the Peruvians claim to be the creators of this delicacy, I wouldn't dream of leaving Peru before indulging in some freshly made ceviche. But I will save the best for last. Puerto Rico. And what will I find in Puerto Rico? And, while I'm sure there are awesome must-see attractions, stunning sights and vibrant culture, None of those will be the real reason for my visit. That honour belongs to coquito. And it is The-Best-Damn-Thing-I've-Ever-Tasted. I'm not kidding. I pretty much polished (almost) the entire batch of this over the weekend. By myself. TheHusband proclaimed it "too coconut-y". Pffft. And that's a bad thing, how? Because lemme tell you, I had to stop myself from literally glugging this creamy drink straight from the bottle. Yeah, it got pretty barbaric around Casa del Pot this weekend. Barbaric is good, right? PS: If you feel the need to whip up multiple batches of coquito and send me everything some of it, I won't stand in your way. PPS: Oh! I'm submitting this to Regional Recipes, where our destination for August is Puerto Rico. If you'd like to submit something to our lovely host Joanne, you can still do so in the next 24 hours as the deadline is the 31st of August. 1. In a large bowl, whisk condensed milk, evaporated milk, coconut milk, a cup of rum, water, cinnamon and nutmeg together. Taste, adding more rum if you wish. 2. Decant into a pretty bottle and serve chilled, over ice with perhaps some more cinnamon and nutmeg sprinkled over. 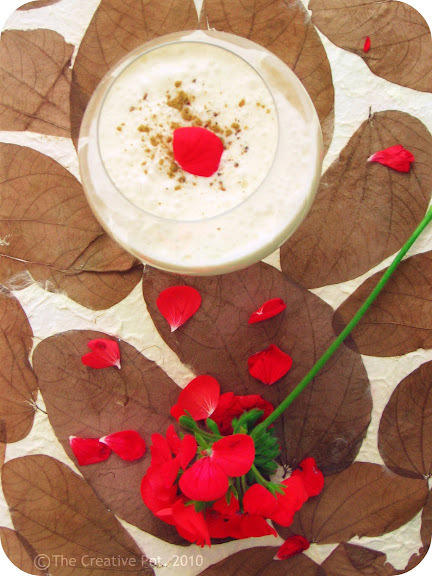 Coquito is a popular Christmas drink in Puerto Rico and has a subtly spicy, creamy flavour reminiscent of eggnog, however traditional Coquito is egg-free. 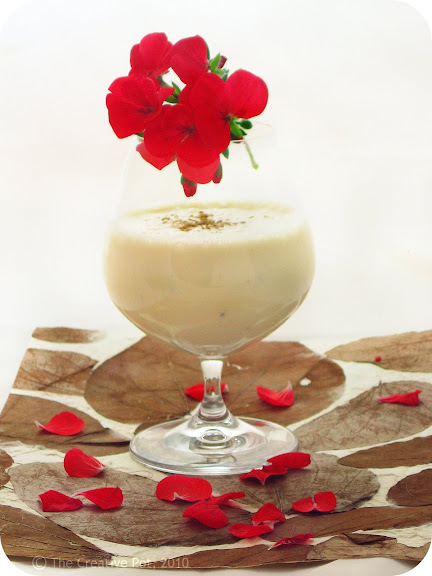 A Venezuelan version of this drink adds egg yolks for a richer drink which is referred to as ponche crema. Man, to hell with any Monday blues, this baby will kick me right into Tuesday!! Amazing!! Wow, Marisa! That styling is just awesome. Didn't go through the recipe yet but wanted to say this first. Beautiful photography! Is there such a thing as too coconutty? Hmm. I think not. Don't worry. Yesterday my dad told me that a peach pie I made was too sweet. Men can just be ridiculous. This coquito looks fantastic! I've never heard of it before but after seeing this...I want it. OMG! not only this name is really cute (anything ending in -ito sounds cute, for me) but the ingredients are so tempting: Love rhum, love coconut and love spices! I am trying this soon!! I'm with you -- the more coconut-y, the better! This sounds delicious and it's so beautiful! Prerna - Thank you! Really appreciate the positive feedback. Sweet Artichoke - The "ito" suffix does sound cute, doesn't it? Enjoy this! Faith - LOVE coconut flavoured things and am crazy about coconut juice, pity I have such a hard time finding it. When you leave on your trip remember me - I love your itinerary! As for that drink - I'm in love, sweet and coconutty - what can be better? Ai curumba! That looks like (delicious) diabetes in a cup... Pour me one! Oh wow... die fotos is so mooi! Rose - Watch this space, I am definitely going on that trip in the next few years! You transported me to wonderland :) Beautiful drink by the sea side with some gorgeous pictures. Can I come on the trip with you? I'd like to visit all those places! I'd also like to have a coquito right about now. Oh how I love frothy sweet drinks. My family is from the Dominican Republic, a neighboring island but I have LOTS of Puerto Rican friends who are experts at making Coquito. It is so amazingly delicious and totally kicks store bought egg nog to the curb. Sounds wonderful! Will have to try this in a few months to bring me out of my winter blahs. 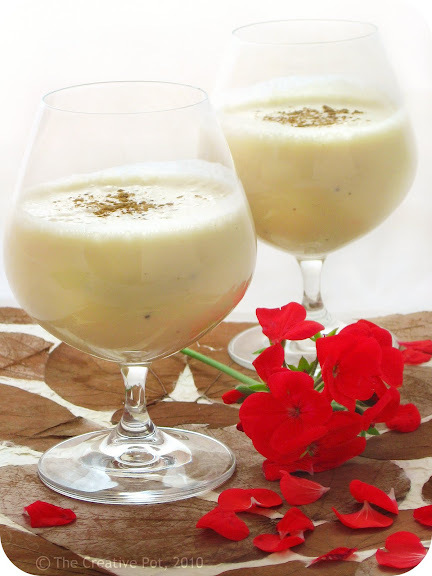 Coquito is also typically Mexican, a drink to celebrate Christmas. Here in Mexico, we make it with egg yolks and leave out the water. I just put a flask in the refrigerator to age for a week--company is coming for dinner on the 26th and we're serving coquito with dessert, a fabulous orange and almond cake. I hid the flask in the farthest-back corner of the refrigerator--let's see if it lasts till next Sunday! It's good as is, but it's so much better when it ages for a week. Thanks for the idea - that sounds rich and delicious! Think I should give that a go for Christmas. give that a go for Christmas. OMG that sounds absolutely fantastic! And even better that Mr Pot does not like it - MORE FOR YOU! !